On a dreary grey day in Toronto it’s always nice to speak about a destination which is perpetually green. 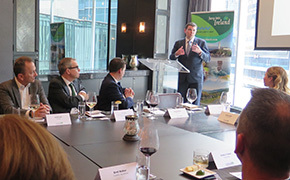 Particularly in the company of some of Canada’s leading tour operators and with folks as friendly as Brendan Griffin, Ireland’s Minister of State for Tourism and Sport. With the ease of charm and self-deprecating sense of humour that the Irish are famous for, Griffin kept us entertained and informed about the state of tourism in his home country, particularly vis a vis the Canadian traveller. And it’s a pretty good story these days. 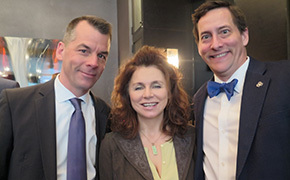 Canadians have cracked the 200,000 travellers per year benchmark – most coming from Ontario – and there’s now lift from five carriers: Air Canada, Transat, WestJet, Aer Lingus and the French carrier ASL. Griffin grew up on the west coast of the country and as the son of a hotel porter appreciates tourism more than some. “Over 10% of our workforce are employed in tourism – not only does it give the chance for young Irish people to stay at home, but it can provide a much-needed livelihood for our rural communities,” he told us. 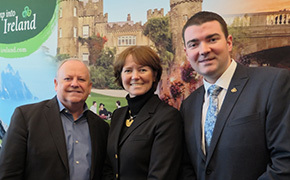 Also present at the luncheon were members of Tourism Ireland’s Toronto team and New York-based Alison Metcalfe, head of Tourism Ireland for North America. 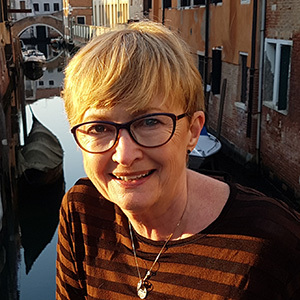 “The wonderful lift makes it easy to buy Ireland year round and we’re encouraging travellers to get Ireland off their bucket list,” she remarked. The luck of the Irish indeed!